PITTSBURGH (AP) — Sidney Crosby enters the faceoff circle with a plan every time, well aware it will almost certainly evaporate once the puck smacks the ice. That doesn’t stop the Pittsburgh superstar from doing it, because every once in a while the idea in his head morphs into reality. Times like Wednesday night, when Crosby’s improvisation helped move the Penguins within two victories of the Stanley Cup. Crosby’s faceoff win helped set up Conor Sheary’s perfectly placed wrist shot 2:35 into overtime, one that lifted the Penguins to a 2-1 victory over the San Jose Sharks and a 2-0 lead in the best-of-seven series. It’s the one Crosby got right that will live on if the Penguins find a way to close out their fourth championship. Just before heading to the dot to the right of San Jose goalie Martin Jones, Crosby told Sheary to line up on the wall and then look for a soft spot in the San Jose defense. Crosby won the draw and dropped it to defenseman Kris Letang, who feigned a shot then slipped it to Sheary. The 23-year-old rookie zipped it over Jones’ outstretched glove for his fourth goal of the playoffs and second of the series. “It’s pretty surreal,” said Sheary, who began the season in the minor leagues. Game 3 is Saturday night in San Jose. Sharks defenseman Justin Braun tied it with 4:05 left in regulation, but San Jose fell to 0-4 when pushed to overtime in the playoffs after getting largely outplayed for much of the night by the quicker, more nimble Penguins. Phil Kessel scored his 10th goal of the postseason for Pittsburgh, and Matt Murray made 21 stops. The Penguins have not trailed at any point while reeling off four straight playoff victories after falling behind in the Eastern Conference final against Tampa Bay. Maybe, but time is running out. Only five teams in NHL history have come back from a 2-0 deficit in the final to win the Cup, a hole the Sharks find themselves in despite Braun’s second career playoff goal and 28 stops by Martin Jones. “We know that if we play this way we’re not going to win games, so we need to be better,” San Jose center Logan Couture said. The Sharks blamed themselves for their shaky start in Game 1, with defenseman Brent Burns admitting the spectacle of playing the franchise’s first Finals led to spending a large portion of the first period standing around and watching the Penguins take an early lead on the way to an eventual 3-2 victory. Burns and his teammates promised repeatedly they would be sharper and more focused faced with the prospect of heading home in a massive hole, pointing to their 5-1 record this postseason in games immediately following a loss as proof of their resilience. While the Sharks were better Wednesday, the sustained push the Penguins were expecting from the Western Conference champions failed to materialize until it was nearly too late. Pittsburgh did the two things that have been the club’s hallmark since coach Mike Sullivan took over for Mike Johnston in mid-December, controlling the puck and forcing the San Jose to go a full 200 feet to create chances. “I think that’s the identity of our team,” Sheary said after becoming the fifth rookie to score in overtime in a Cup final. Pittsburgh’s forecheck made San Jose labor just to get the puck in the offensive zone and once there, the Penguins kept throwing black-and-gold glad bodies in the way. Still, it took time for Pittsburgh’s heady and hectic play to translate into a goal, with the group that’s been Pittsburgh’s best line for the last three months finally breaking through against Jones just before the midway point. Thrust together as an experiment when Evgeni Malkin went out with a left elbow injury in mid-February, the trio of Kessel, Carl Hagelin and Nick Bonino have rapidly evolved into Pittsburgh’s most dangerous line. They began the night with 90 combined points in 34 games, and added to it during another typically aggressive shift when Hagelin stripped it from San Jose defenseman Roman Polak and slipped it to Bonino in the slot. It appeared as if it would be enough to wrap things up in regulation until Braun found a moment of joy in the midst of a difficult time for his family. Braun’s father-in-law, former Flames and Blackhawks center Tom Lysiak, passed away on Monday following a lengthy fight with leukemia. Braun remained with the team, pledging to pay his respects to Lysiak before Game 3. His first goal of these playoffs — a shot from just outside the top of the right circle that made its way under Murray’s glove and off the post before crossing the line — gave the Sharks a needed jolt with their chances at a first championships teetering. The momentum didn’t last. 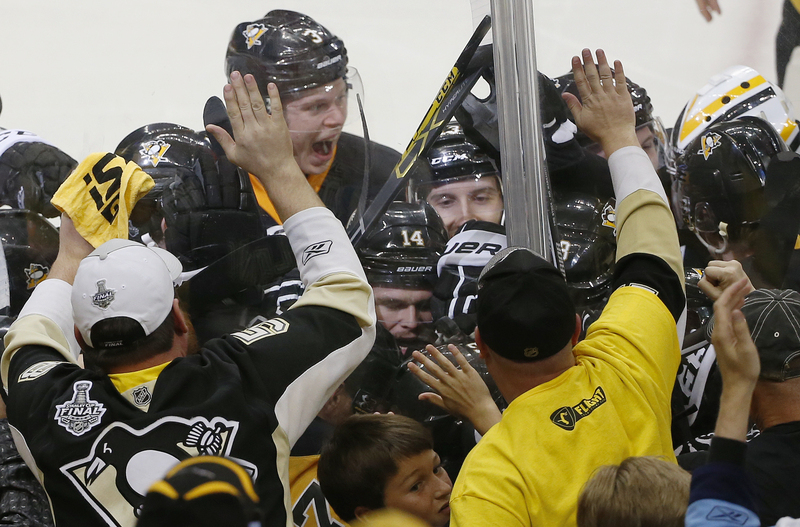 The Penguins wasted little time while improving to 4-2 in overtime.